This I came up with while browsing the scales section for something fun to play (BTW, thank you so much for this website!). It's based on the Enigmatic scale in the C 3rd, A 5th, and D 7th positions, with slight alternate notes on the third string, except A 5th, which is unchanged. I find this to be a great warmup thats fun and moderately challenging for me. The idea is to play it so that each section (of 2 strings) fits in a 4/4 time sig, so at times you'll be playing with 8th notes, and then off onto triplets then other odd combos of 8ths and triplets and I think 16ths. The pattern has a chromatic feel at times and trains my fingers to both stretch and follow different scale patterns than I'm used to. 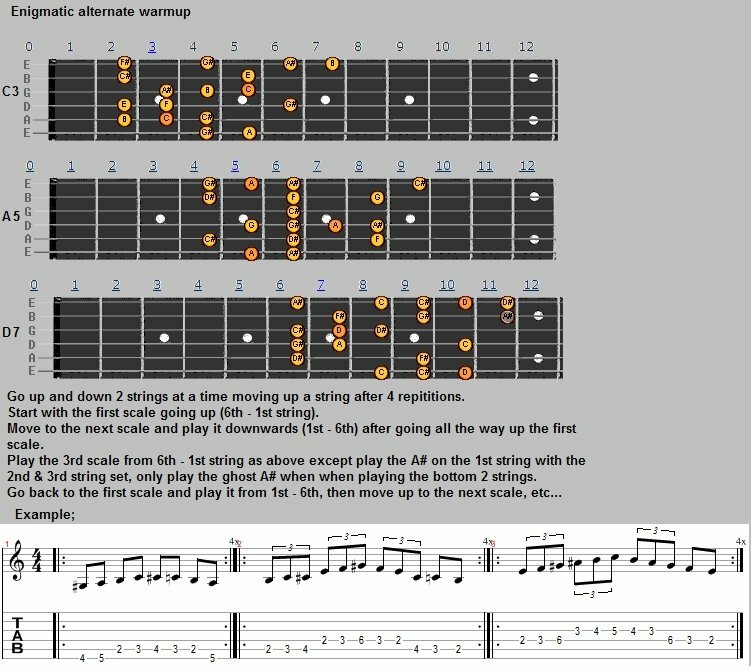 I'm thinking of making a version which adds string skipping after I memorize this progression. It gets a bit tricky with the 3 scale (D7) because when you are palying the 3rd and 2nd string pattern, you also add the A# on the 1st string omitting the A# on the 2nd string (shown as a ghosted note in image), but you'll play the ghosted note when playing the 2nd and 1st stirng pattern (omitting the 6th fret A#). Comments, suggestions and questions welcome. Good stuff man. Keep it coming!